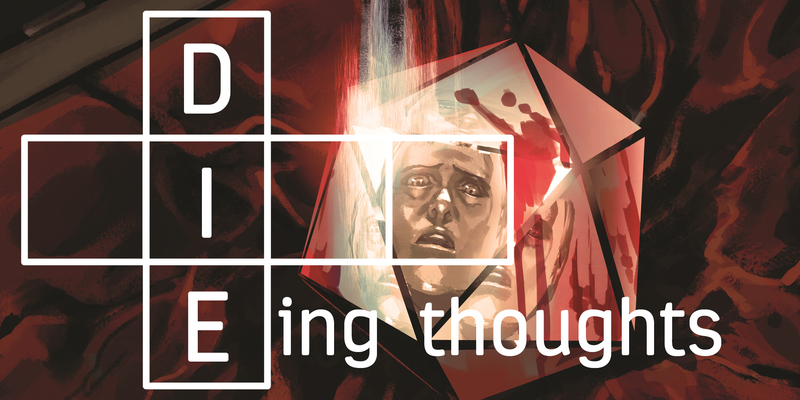 The first issue of DIE, the Image series that looks set to define where Kieron Gillen goes next after WicDiv, lands this Wednesday. Tim + Alex have read a review copy of the first issue, so we decided to talk it over and share the highlights with y’all. We tried to ensure the discussion is pretty much spoiler-free. But obviously, if you want to go into the first issue knowing nothing, maybe bookmark this and come back on Wednesday. Alex: So, what did you make of it? Tim: I enjoyed it a lot. 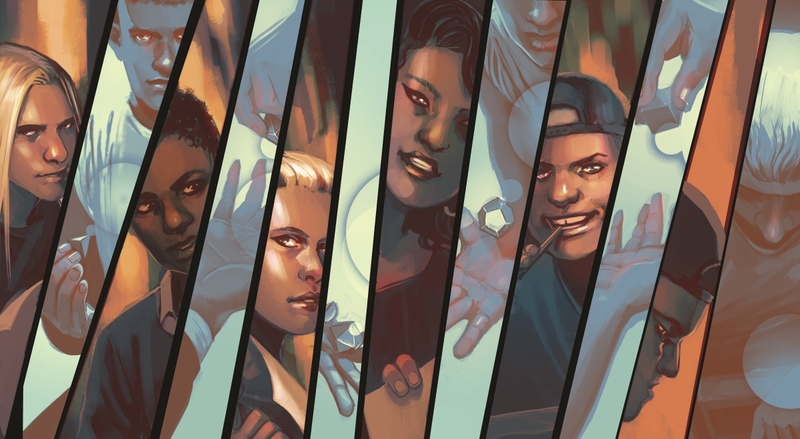 I don’t think it had quite the same immediate impact as the first issue of WicDiv, but there’s a lot I’m excited about. Alex: That is, unsurprisingly, the first comparison I immediately reached for. Is it the first creator-owned ongoing Gillen has launched since then? Tim: I think so? Uber launched before WicDiv, and Mercury Heat was only 12 issues. Alex: Anyway, for me it definitely has that same feeling of, oh, okay, this is what Gillen is interested in doing next. The Wicked + The Divine #1 surprised both of us, I think, because it was so firmly plot-driven. After years as dedicated Phonomancers, it was weird to see a Gillen + McKelvie pop-music comic that ended on a big cliffhanger. Tim: Yeah, whereas this has a much more obvious plot built into the premise, so there’s not that same element of surprise. Alex: I think the question of ‘growing up’, and what exactly that means, is fairly front and centre – but you’re right, there’s no single image that captures as cleanly as that big ol’ skull. There’s something about DIE that took me right back to Phonogram: Rue Britannia. It almost feels like it’s from a completely different career trajectory that Gillen could have followed. The one I would have extrapolated from first reading Rue Britannia, maybe – but then Singles Club came along and nudged him in a different direction. It might be in the captions – as Gillen himself pointed out to me, just the sheer quantity of them – but I think it’s also got something to do with the emotions it’s handling. But also, there’s a line in the second issue (I’ve read #2 and #3): “This is what happens when thoughts curdle”. That kind of sums up DIE’s vibe, and it reminds me of the way Rue Britannia presented people. Tim: One thing it did make me think about is the convergence of ‘everyone plays more or less the same character in every RPG’ and Gillen’s author insert characters. There’s an interesting journey to chart from Kohl to Loki to… Woden + Baphomet + Cassandra? And wondering who (if anyone) his avatar would be here. Alex: I think the muddle of that final equation probably tells you everything you need to know about how his approach to characters has evolved. I suspect everyone is him, to a more-or-less equal extent. Tim: I feel like there was talk in at least one WicDiv interview about that book being part of a process of sorta symbolically killing himself off. It makes sense that he’d try to fall back on that idea less, even as he touches on themes that are very connected to his current mindset. Alex: There are definitely connections there, though. The ritualistic obsessiveness of Sol takes me back to Lloyd. I suspect Chuck is Gillen’s own worst fears about becoming, essentially, Garth Marenghi. The quiet mathematician of Matthew is a part of himself I don’t think he’s put in a character yet. Tim: Have you played any Dragon Age? Alex: I have not. I’m not a nerd, Tim. Tim: Chuck’s look in the game is very evocative of a character in that, who also happens to be a storyteller and producer of pulp novels. Alex: This actually raises a kind of interesting point. DIE is the furthest a Gillen comic has ever strayed from my particular pool of reference points. Fantasy and role-playing games aren’t something I have a particularly strong relationship with. It’s kind of the first time I’ve been able to test out the claim that, y’know, you don’t need to know about Britpop to enjoy Phonogram. All that puts it much more, I think, in your territory? Tim: To a certain degree, but I’ve never been a particularly big fantasy reader outside of Pratchett and a one-time slog through Lord of the Rings. I’ve no history with Moorcock and the other big names of that world. Alex: But when it comes to RPGs, you are the Master. Tim: I certainly got all the references. Alex: Did it ring true to your experiences of sitting around a table with paper and pens and dice? By which I mean, have you ever disappeared into a fantasy world of your own creation for two years? Tim: Yeah, I think so. There are certain concessions made for the sake of storytelling, if that makes sense, but it certainly captures a lot of the atmosphere. Alex: Here’s a thing – I’ve now read the first three issues, you’ve only read #1 so far – do you get a feeling from that first issue what DIE is? Tim: I would say not? I think I need to see more what a ‘standard’ issue looks like to get a proper sense of it. Right now, I’m intrigued to see how it’s broadly structured – i.e. whether we’re going to have time in and out of the ‘game’ each issue (presumably in the form of flashbacks). I think I could probably tell you what it’s about, but not necessarily what it is. Alex: The main feeling I had after reading that issue for the first time was just hunger. I needed to see more, and I think what you mention is part of it. This is the cold open, the pitch, the hook. Tim: Yeah, absolutely. I’m sure I’ll be buying it in singles, but I also have the sneaking suspicion it may read better in trade? Alex: The weird thing about that – which I can totally see – is, it does feel like you get a lot for your money. Because each issue is a couple of pages longer than your average comic, I think, even after the first bumper issue – but also because they’re quite wordy, and Gillen’s writing proper backmatter essays again. And because there’s a lot to drink in in Stephanie Hans’ art. 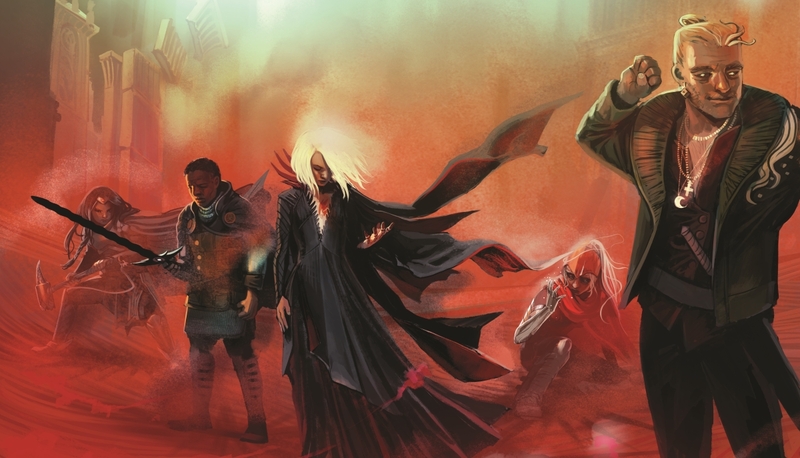 On which note… the WicDiv connection means we’ve talked a lot about Gillen, but DIE is an absolute star turn from Hans. Tim: Oh absolutely. I’m really interested to see what she brings to the table, both in terms of art and the story. Alex: That’s the exact comparison I went to, actually. There’s a moment in issue #2 specifically that gave me what I think of as the ‘Saga giggle’ – y’know, where you laugh out loud at the audacity of a new planet or monster design. A little tease for everyone there, to make sure you come out of issue #1 with the same hunger for more that I did.